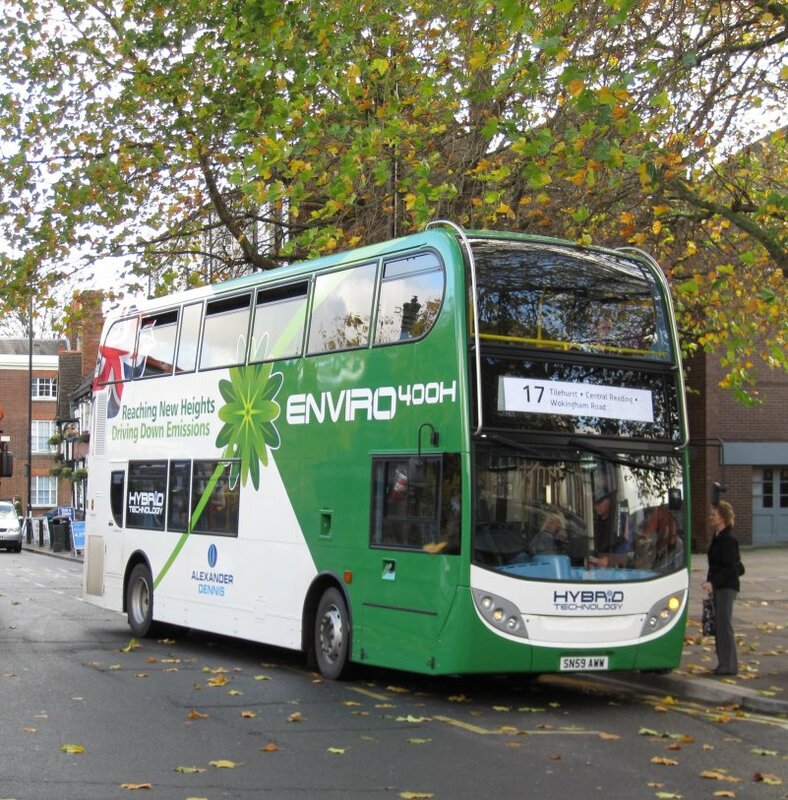 The first six Enviro 400Hs were ordered on 14th April 2010 following the company's successful submission to the Government's Green Bus Fund competition held during 2009. Each bus cost a total of £300,000 of which £108,000 (the additional cost of being a hybrid) came from the government. The funding bid also included provision for a further 14 similar vehicles in 2011 if the first 6 prove successful. Further funding was obtained in the second round of the Green Bus Fund competition to provide a 11 more vehicles which were ordered along with the 14 remaining from the first round as a batch of 25, making a total of 31. Arrivals of the second batch commenced with 210-12 sometime between 27th and 29th June 2011 and 207/13 by 2nd July. After a short gap 216 followed on approx 25th July after being seen at the Leyland staging post on 23rd with 214/7/8 following soon after. 208 was seen at the factory in Falkirk on 28th July and arrived on 2nd August, and 209 arrived on 3rd August. 220 was seen at the factory in Falkirk on 30th August 2011, and 219-21 the Leyland staging post on 4th September pending delivery the following day. 222 arrived on 6th September, 223 on 7th, 224 on 8th, 225 by 11th, 226 by 11th, 227 on 12th (after being noted at Leyland on 11th), 228 on 21st, 229 on 21st, 230 on 23rd and 231 on 27th. 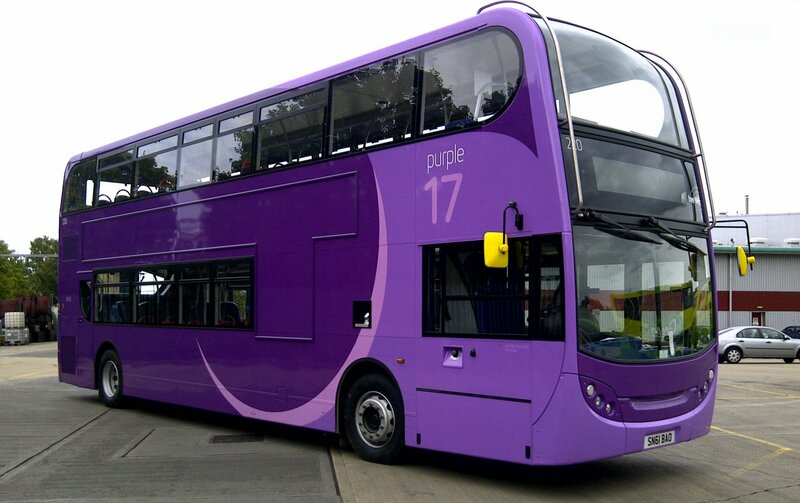 In September 2012, 208 was repainted into Purple 17 livery to allow a daytime frequency increase from every 10 minutes to every 7-8 minutes. It was back in service by 24th September 2012, the day the timetable changes were made. 202 - Marion Dollery, a significant local person recently supported by the Duchess of Kent House Hospice, the company's charity of the year at the time. Applied 3rd July 2011. 203 - Joan Taylor, a significant local person recently supported by the Duchess of Kent House Hospice, the company's charity of the year at the time. Applied 3rd July 2011, removed by August 2015. 204 - Kenneth Solly, a significant local person recently supported by the Duchess of Kent House Hospice, the company's charity of the year at the time. Applied 3rd July 2011. 205 - Phyllis Haydon, a significant local person recently supported by the Duchess of Kent House Hospice, the company's charity of the year at the time. Applied 3rd July 2011. 206 - Bob Gray, a ‘happy, proud family man’ who died in 2008 at the age of 63 having been supported by the Duchess of Kent House Hospice, the company's charity of the year at the time. Applied by 9th November 2011. 207 - George Strong, a customer who was supported by the Duchess of Kent House Hospice, the company's charity of the year at the time. The family of the late George Strong of Tilehurst made a donation to the hospice for the bus to be named in his memory. Applied 7th September 2012. 212 - Gordon Marshall, the Vice-Chancellor of Reading University who was hugely influential in the implementation of the University's carbon management programme launched in 2010. He left the University in Summer 2011. Applied 19th September 2011. In April 2014 226 gained a white LED display on the front, being noted in service on 16th. 216 was treated the same in November 2016, first being noted in service on 25th. 207 (yellow), 211-8 (claret) & 219 (purple) went on loan to First Glasgow for the Commonwealth Games on 8th July 2014, completing the journey up over two days with a stop over night in Warrington. They returned the same way on 4th and 5th August 2014. 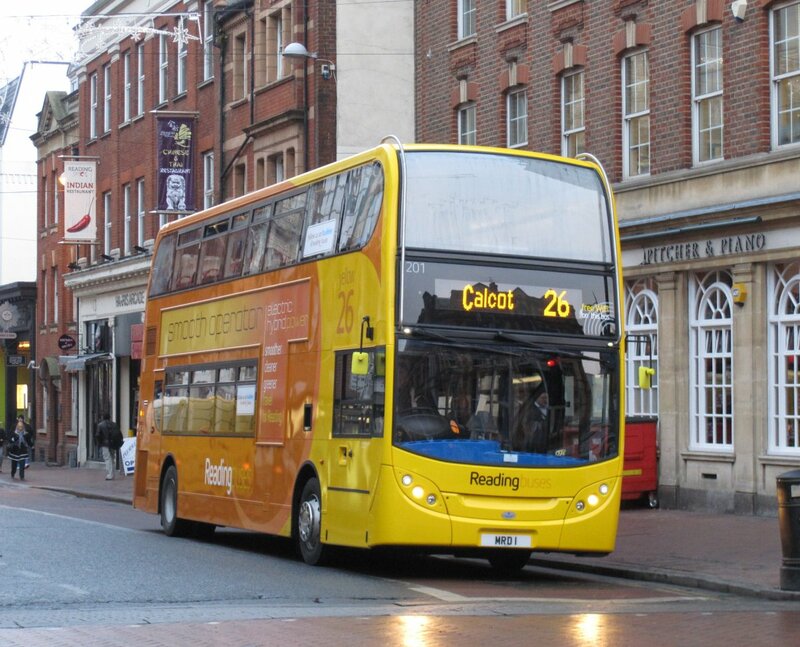 210 into yellow 26 livery during August 2014, it was repainted at Bennett Trucks by 21st August, returning to service on 27th. 213 into generic silver, returning by 7th December 2014 and re-entering service on 9th. 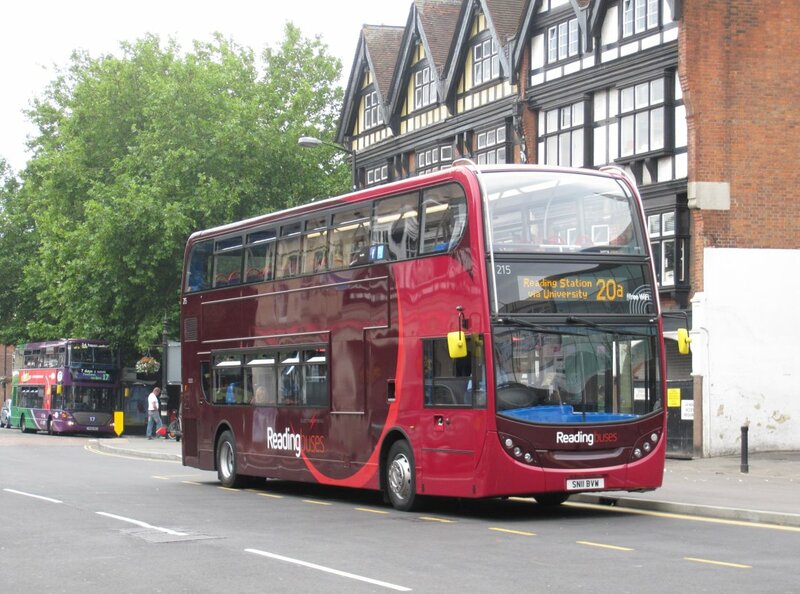 Following the acquisition of First Berkshire's route 90 from 26 July 2015, the allocation of the above was again reviewed to provide better utilisation than afforded by running term time only shorts to the University or as part of the generic fleet. Consequently, 8 out of the required 10 vehicles for the 90 (rebranded as Lion 4 / X4 from 31st August) were E400Hs 209/211-7. The vehicles were sent to Thornton's for repaint and refurbishment with wood effect floors, new black spot moquette, USB charging points and 4G WiFi added. The first to return was 216 by 31st July, which re-entered service on 1st August in base Lion livery. 217 followed by 8th August, 214 by 9th August and 215 by 15th August. 212/3 were away as at 16th August, with 212 back in service fully branded by 28th. 214 and 217 had received full Lion livery by 27th for use as part of the official 'safari' launch event, pending the service changing from 31st August. 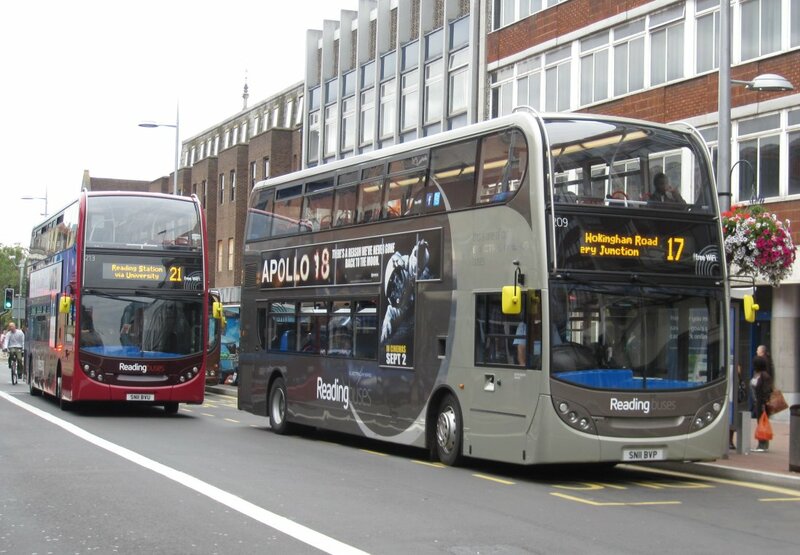 The penultimate one to be treated was 211 returning to service by 23rd September, with the last 209 held back until February 2016 pending other acquisitions for the generic fleet. In March 2016 223 gained a full colour front destination display similar to those in 1101-14. The batteries in the E400Hs have a 5-year life-span and warranty, so trials were carried out during 2016 under a scheme supported by the DfT's Clean Vehicle Technology Fund as alternatives to direct replacements. 205 went away in approx March 2016 to Magtec for the installation of a plug-in-electric drivetrain with a 750cc on-board Compressed Natural Gas (CNG) engine to extend the range of the bus. It returned in September 2016 and spent a couple of weeks shadowing buses out of service. It went away for further enhancements to extend its range, returning on 2nd December and carrying out more tests in February 2017 before returning to service on 24th July 2017. It was fitted with updated E400 front lower dash panels and lighting whilst it was away the second time. A second example is having a Vantage Power series-hybrid system fitted, bringing stop-start and selective zero emission running capability. 223 went away to Scarborough and District in January 2017 to be converted to standard diesel operation using the existing engine, replacing the batteries with a gearbox. It returned to service in May with most of it's electric hybrid branding removed. Following the successful trial with 223, conversions started on the remaining route 17 hybrids upon failure, pending cascade onto other routes at the end of 2017. 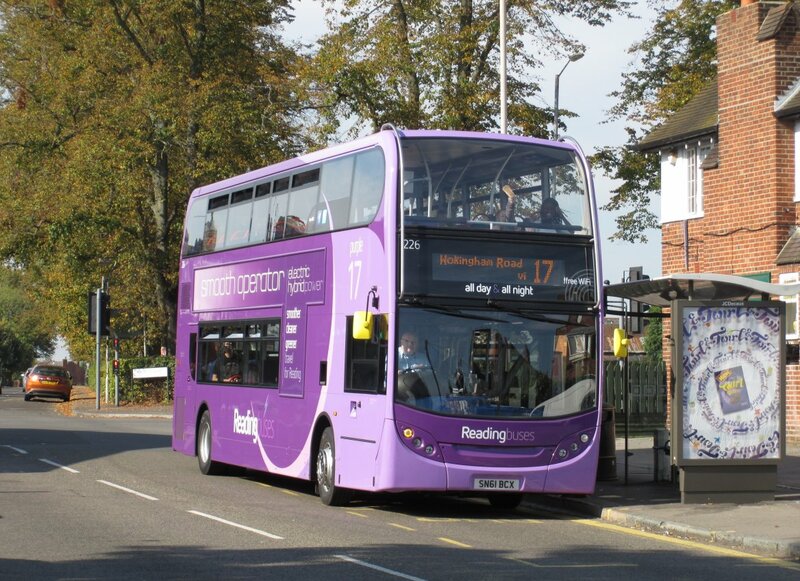 218 lost its branding for route 17 in February 2018, operating in base purple livery pending repaint. 222, 224 and 226 were treated similarly by the start of April. 225 returned in October 2017, and was the first to be fully refurbished and repainted into an updated Sky Blue livery for routes 15 and 16. 221 and 228 were away during December 2017, 221 returning in Berries livery by 14th March and returning to service on 20th, and 228 returning to service in Sky Blue livery on 30th March. 220 was repainted into Berries livery in February 2018, returning by 15th and returning to service on 17th. 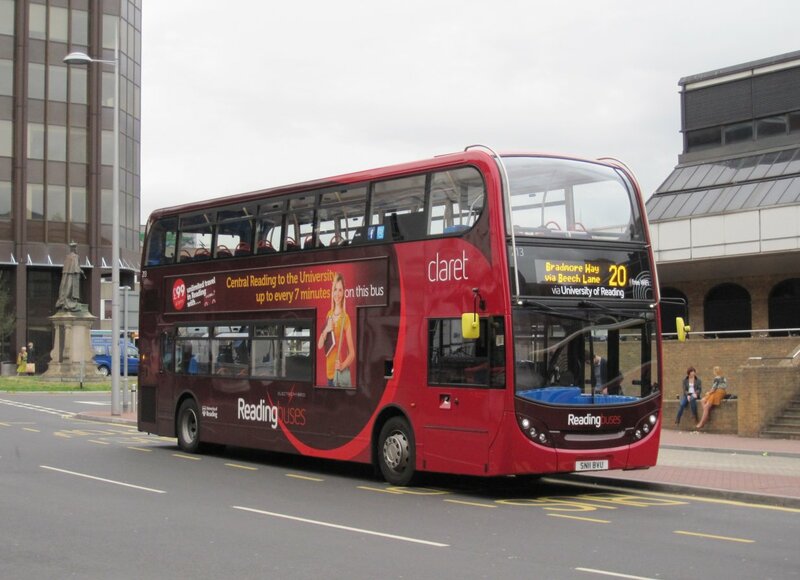 230 was away in March, and attended the Association of Local Bus Company Managers conference in Scotland on 1st May prior to returning to Reading by 4th May and re-entering service on 5th. 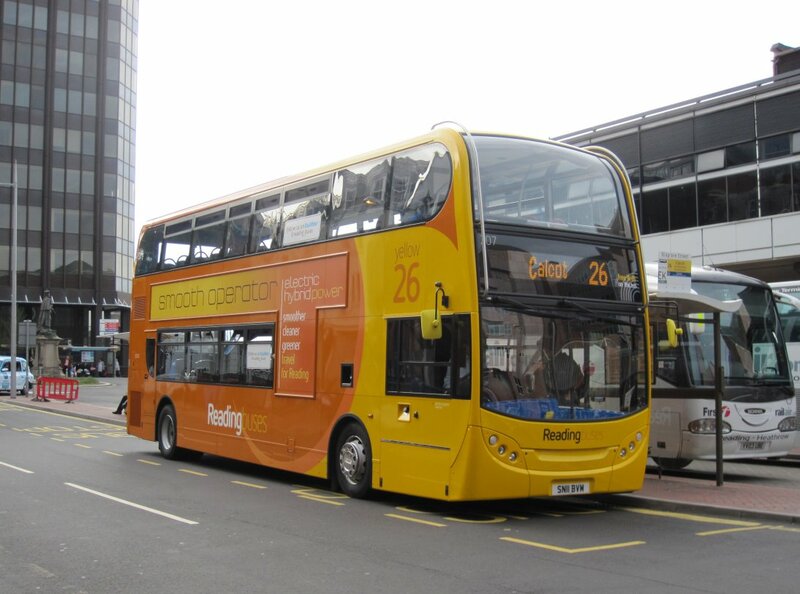 231 went away on 2nd March, returning to service on 25th May. 223 was refurbished repainted into Berries livery in May 2018 following its earlier diesel conversion, returning to service on 5th June. 227 returned to service on 21st June in Sky Blue livery. 203 was written off following an engine fire at Calcot Sainsbury's on 14th May 2017 and taken away in late June. 220 went on loan to Newbury on 15th January 2018 until 30th January, being replaced by 223 from 31st January until 9th February to cover 1208 transferring to Greenline work pending changes to the Vodafone network. 231 then went on loan to Newbury on 16th February, returning on 2nd March. 223 went on loan to Newbury again on 13th March until 25th April. Following swiftly on from the announcement of the Green Bus Fund funding, an E400H demonstrator SN59 AWW was borrowed between 2nd and 4th November 2009, appearing in service on route 17 on 3rd and 4th. It was hailed by drivers and customers alike as an outstanding vehicle. A dozen prototype ADL 400 Enviro hybrids had also been running very reliably in London on routes 16 and 24 for the past 18 months which were also reported to be excellent. 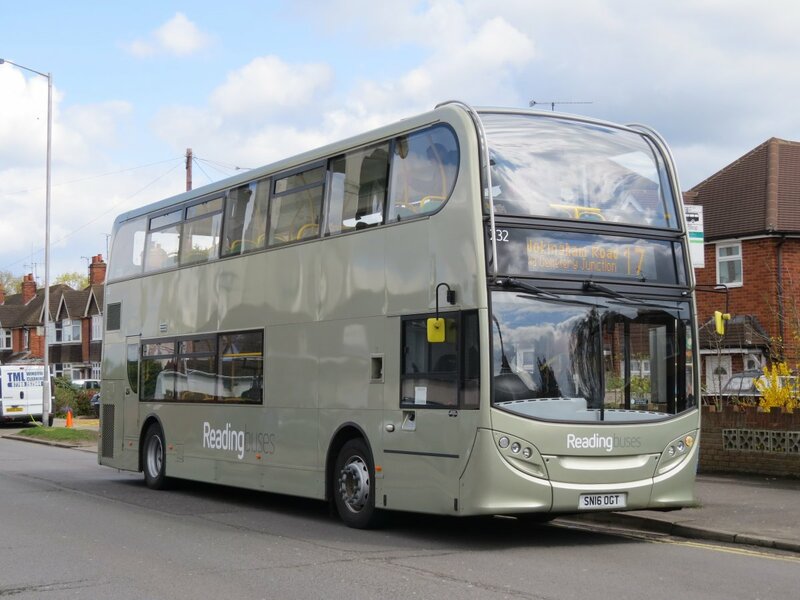 At the heart of this hybrid is a system developed by BAe Systems, Rochester which has been widely used in America over the last ten years, coupled with familiar Alexander Dennis parts. A battery powered electric motor provides the traction with a small diesel engine (in the case of the demonstrator the same as fitted to ADL Enviro 200 Darts) charging modern lithium-ion batteries. Power is also derived from regenerative braking where energy that would normally be converted to heat or sound is diverted back to the batteries, meaning that overall the Enviro 400H is guaranteed to be at least 20% more fuel efficient than a normal diesel powered vehicle. The cost of the batteries and specialist systems mean that the vehicles are considerably more expensive to buy, but the manufactures expect that the fuel savings will pay for a significant amount of this when factored across the whole life of the vehicle. In addition, as the vehicle does not use a gearbox it has a significantly smoother ride. The demonstrator returned briefly on 15th April 2010 to coincide with the press release regarding the order of the first vehicles. A further demonstrator SN63 VTX arrived on approx 21 October 2016 on extended loan. It was given fleet number 233 and was last seen in service on 19th January 2017, moving to Cardiff Bus on 23rd where it was in service on 24th.